On Election Day here in the U.S., it would do well to remember that it’s been 100 years since the final push that put the Soviets over the top in Russia. There are so many bits of the 20th Century that we should never forget. While the Holocaust and its horrors are remembered, some horrors are a bit too inconvenient for those who would like to “get it right this time”. Forgetting that all the dead bodies was part of “getting it right”. 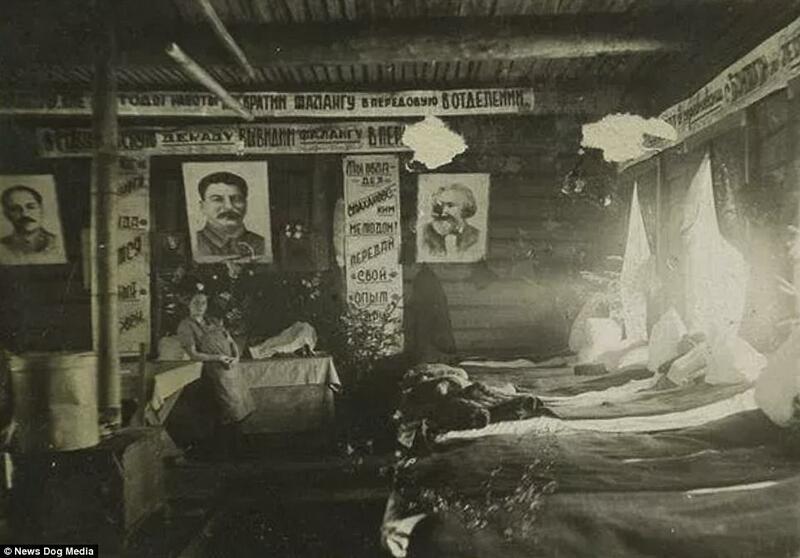 The “October Revolution” (which occurred November 7-8, 1917) was simply the jumping-off point for so much to come. The violence inherent in the system wasn’t merely pushing around a peasant in a field of mud, but subjugating everybody, from the lowest to the highest. But this time it’s different, you see. You can read more at the Daily Mail UK. There are loads of pictures at the link, including masses of bodies that resulted from the Soviet system (only a couple pictures of dozens of bodies, but that’s enough). Part of that famine was deliberate mass starvation in Ukraine — known as Holodomor. The Holodomor … also referred to as the Great Famine, and The Ukrainian Genocide of 1932–33 was a man-made famine in Soviet Ukraine in 1932 and 1933 that killed an officially estimated 7 million to 10 million people. It was part of the wider Soviet famine of 1932–33, which affected the major grain-producing areas of the country. While we may think deceptively editing video over Trump feeding fish is a new low, the most shameful time of journalism was during the decades of Stalin’s rise, when Soviet crimes were papered over. The Duranty Prize is named after Walter Duranty, the New York Times Moscow correspondent in the 1920s and 1930s who whitewashed Joseph Stalin’s forced starvation of the Ukrainians (the Holodomor) and many other aspects of Soviet oppression. Duranty was awarded the Pulitzer Prize in 1932 for his efforts. It has never been revoked. It was a hell of a lot of eggs… and there ultimately was no omelet. 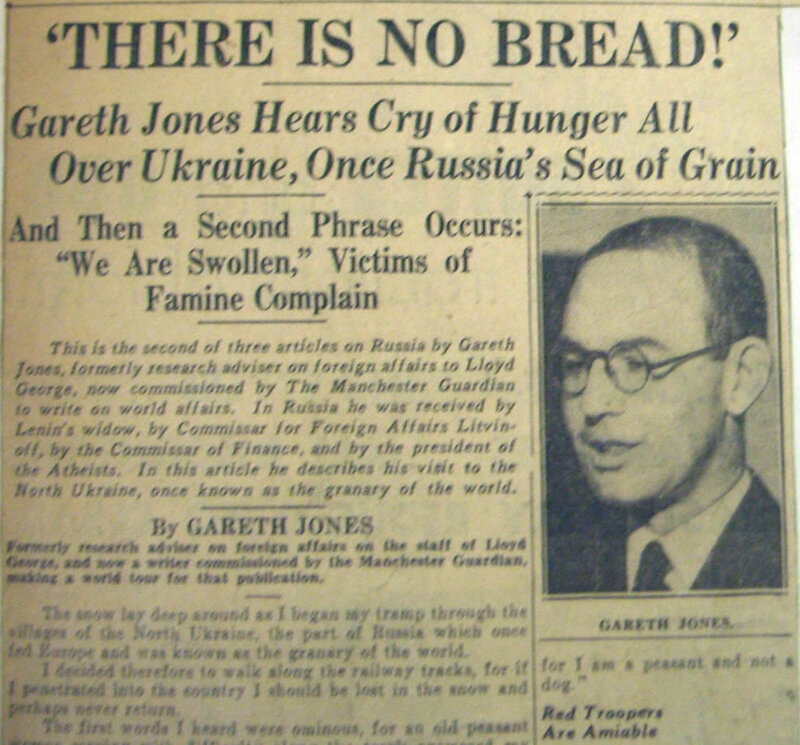 UPDATE – Here’s an antidote to Duranty: Gareth Jones, a Welsh journalist who uncovered the Holodomor while Duranty turned a blind eye. Jones was murdered in mysterious circumstances in 1935, possibly by Soviet agents. In response to this, there are hundreds of NY Times readers weighing in to attack Stephens and defend a) Democratic socialism, b) Bernie Sanders and Jeremy Corbyn, and c) American progressives in general. There are apparently even some genuine communists in the U.S. military. Granted 5,000 members is a tiny number in a country as large as the U.S. but so are the number of people supporting outright racists like Richard Spencer. Spencer gets routinely condemned (and rightly so) by the media while U.S. communists rarely get mentioned. As for everyone knowing it’s wrong to support dictatorial communists (as opposed to wonderful Euro-socialists) I don’t know if I’ve ever seen someone wearing a Stalin shirt in the U.S. but I’ve certainly seen people wearing Che Guevara paraphernalia. The left has certainly gotten very quiet about Venezuela in the past year but many of them adored Hugo Chavez, including Sean Penn, Michael Moore, and Oliver Stone. Another person who praised Chavez, as Bret Stephens correctly points out, was Jeremy Corbyn. It’s worth noting that Corbyn did not see Venezuela as an example of extremism, communism, etc. He saw it (and apparently still sees it) as a model of “socialism” done right. Bret Stephens is absolutely correct about the tendency of the far left to excuse communist excesses even while going on about the pressing need to eradicate fascism in our midst is a problem. The fact that so many NY Times’ readers are eager to shield socialists like Corbyn even as Corbyn refuses to distance himself from dictators like Maduro suggests we still have a long way to go in recognizing that problem. Simply put, there really is solidarity between far-left leaders here and in Europe and far-left dictatorships like the one in Venezuela. That it becomes inconvenient for the left to acknowledge that at times does not make that solidarity cease to exist. Jeremy Corbyn is a loathsome person for loads of reasons — being a communist/socialist (not much of a difference in him specifically) is just part of it. A huge part of it. Many of these people know that for communism to “work” means that “bad people” need to be killed. The thing is, when others start finding out what these “bad people” did to be targeted by communists, it becomes obvious that the monsters are the communists themselves. It’s not a great selling point. The smearing of anti-communists continues, and one need not do anything other than show the truth: the numbers of people killed, the people imprisoned, the locations of the graves. ARE WE SURE THEY MEANT WELL? “They will write about Stalinist playwright Lillian Hellman in tones of sympathy and understanding they never extend to film director Elia Kazan” because Marxism is ostensibly a moral enterprise. However many millions it killed, it meant well. The irony of this defense is that the Communist Manifesto argued morality doesn’t exist. It was simply a construct of the Party. It doesn’t even matter how many proofs there are that “they” didn’t mean well. All of them — not only Stalin, but Lenin and Trotsky. And obviously Marx. 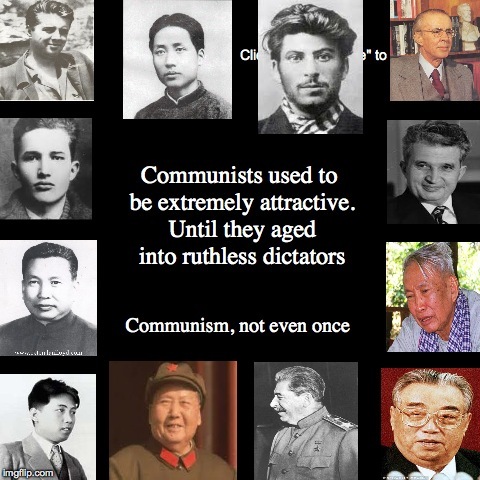 But plenty of people are still seduced by communism. Some are obvious hypocrites, like Corbyn, who live cushy lifestyles in decidedly non-communist and extremely capitalist nations. Some are foolish youngsters, as with my one-week stint as a commie followed by my few months as a Randite. I went on to vote for Bill Clinton the next year. Look, we all go through these adolescent phases. Young people now aren’t any wiser than I was in the 90s. And some welcome the evil, seeing it as an opportunity to pull down and take stuff from the people they don’t like. How dare they have nice things. How dare they have food. How dare they breathe air. Well, Stalin got to live his dream, as did Mao and Pol Pot. Chavez managed to miss the culmination of his particular Venezuelan hell, but neither did Lenin get to see the full slaughter. Poor, dead commies. Anne Applebaum: 100 years later, Bolshevism is back. And we should be worried. 29 Aug 2017 – Meep’s Bookshelf: Get Free E-Books by Russian Dissidents NOW! Finished reading this well thought out book in minutes. This book cuts to the core of all pro socialism debates right on the first page, and sticks to it the whole way through. The material is presented in such a manor that it is easy to retain and recite. This is an amazing teaching guide. Well done. The author entices the reader with a simple and concise, yet eloquent and complete explanation of socialism. I’m sure this will go down as one of the greatest texts ever written on the subject. I found myself furiously consuming the words on each page, totally engrossed in the text. It seemed I couldn’t turn the pages fast enough! I highly recommend this book to anyone studying the subject of socialism as it is sure to give you the best possible understanding of the subject. I would especially suggest this seminal work to any and all supports of Bernie Sanders as this will give you unbelievable insight on exactly what he has been espousing for years. If you read the text and study it carefully, I promise you will have a near doctoral command and understanding of socialism. I have a feeling these readers bought the kindle version when it was free because…. Do not get this book. 200 pages has only two words written in it: “It Doesn’t”. No substantive argument is given. Complete waste of money and time, will return. I agree with the one reviewer who complains there’s no hardcover version. I’d totally buy a coffee table version of the book to leave out for guests to peruse.